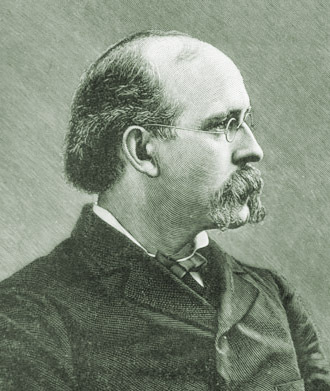 Terence Powderly was born in 1849 in Pennsylvania, the son of Irish immigrants. A machinist until his late 20s, he became a union activist in the early 1870s and joined the secretive fraternal brotherhood of the Knights of Labor in 1874. Within five years he was its Grand Master Workman. In parallel he became the Greenback-Labor Mayor of Scranton, Pennsylvania for the six-year period from 1878. He was responsible for opening up the Knights and leading the massive, if temporary, expansion from about 10,000 members in 1879 to over 700,000 in 1886, making it the largest labor organization in the US..
Powderly’s political interests were eclectic but he generally favored producerism and cooperation over socialism, and education over extremism. In general he was against the use of strikes as a primary tool for labor, and believed instead on a broader campaign to shift the conditions of labor, notably through such issues as the eight-hour day. During the early 1880s when Powderly sought to dramatically change the Knights – notably in relation to secrecy and ritual – the local assemblies of Brooklyn and New York, and specifically Brooklyn’s LA 1562, became highly antagonistic to his leadership and he faced a number of years of hostility from them and from the New York District Assembly (DA 49). This antagonism became focused around an internal dissenting group known as the Home Club. In mid-1882, LA 1562 – which included Theodore Cuno, Matthew Maguire and Peter J. McGuire – was suspended by Powderly. However, support from DA 49 enabled it to re-enter the Order. However, ongoing internal dissensions within the organization, and the impact of the Chicago Haymarket Square Riot of 1886, meant that he was forced out of the organization in 1893. Trained a as lawyer he took on a new career and became US Commissioner General of Immigration from 1897-1902 and the Chief Information Officer for the US Bureau of Immigration from 1907-12. This entry was posted in People and tagged Cuno, Greenbackers, Knights of Labor, LA 1562, Labor Day, Matthew Maguire, Peter J McGuire. Bookmark the permalink.